Automated Palletizer/Depalletizer | Robotic Palletizing Robot Integration - JH Robotics, Inc.
Robotic palletizing provides manufacturers, warehouses and producers with highly customized solutions by implementing cutting edge technology into the palletizing operations. Palletizing robots are capable of handling pallets, tier sheets, slip sheets and more to offer you a seamless end-of-line automatic pallet building and depalletizing integration. Case palletizing solutions from JH Robotics are designed to maximize efficiency and minimize cycles times as well as minimize damage when compared to alternative palletizing methods. Each robotic case palletizer is optimized by JH Robotics’ in-house software engineers to offer maximum point-to-point movement utilizing either four or six axis robots. By integrating extended reach capabilities into your case palletizing robotics integration, you can achieve a 360 degree work area with the result being shorter cycle times and boosted performance. Robotics bag palletizers utilize custom end of arm tooling (EOAT) which can be combined with options such as a vision camera to ensure the non-uniform nature of bagged products are palletized consistently an accurately throughout every cycle. Automated belt conveyors allow for bags to be placed in proper orientation while precise row placement reduces bag contact. Additional options such as automatic pallet destacker, scale weighing system, labels and marking systems can be incorporated into the cell. 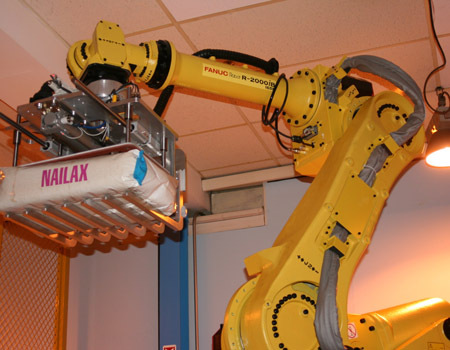 In most applications, cases or bags are fed into a robotic cell after finishing an upstream process such as a filling station. The palletizing robot with then pick one or more cases and quickly and precisely place them onto a pallet in a particular pattern programmed by the software engineer. In the instance of automated bag palletizing, pneumatic actuators will press the bags into shape to provide a more uniform finished pallet. The pattern is constructed layer by layer until the pallet is ready for the next phase of processing. Patterns can easily be changed by the operator. Typically, finished pallets will be automatically shrink wrapped in order to increase pallet stability. 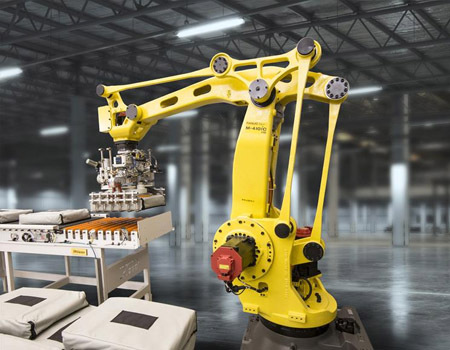 Our team of engineers, designers and integrators have the experience to successfully integrate palletizing robots into your manufacturing process. With over 30 years of experience in the robotics industry we’ve become the experts that manufacturers rely on when it comes to automation. Call us today at 607-729-3758 or visit our online estimate form to get started on making your company more productive, more profitable, and running lean.